Londonist imagines that saying "mind the gap, "stand clear of the closing doors" and endless variations on "The next station is...." for a living can get a little wearisome. Professional voice-over artist Emma Clarke does just that. Hence, she decided to spice up her days by making a few spoof announcements and posting them onto her website, including one that went: "We would like to remind our American tourist friends that you are almost certainly talking too loudly". Arf. Good, clean, harmless fun, you might think. Yet those grim-faced Gradgrinds at London Underground weren't of the same opinion, and Ms. Clarke has been fired. 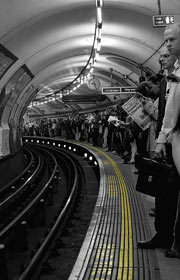 While LU graciously admitted that the spoofs were funny, they allege that the artist described the Underground as "dreadful". The cheek of it! Like some chortling Chekist trying to impress his Politburo boss, a Tube spokesperson said: "London Underground is sorry to have to announce that further contracts for Ms Clarke are experiencing severe delays". Pause for one moment while that tumbleweed rolls off into the distance. Now, really, is this the image we want to be showing the world? That London is a place of stiff-upper-lippedness and no-fun faultfinders who can't take a joke? Are the poor minnows in charge of the Tube so afraid of criticism that they'll smite anybody who sneers at their beloved network? More importantly, with Ms. Clarke seemingly out of the picture, they need to find a replacement voice artist. Could be a great idea for a reality show, that.